Between the 1950s and the late 1970s herring strip was the principle natural bait used by BC salmon anglers who preferred to troll rather than cut plug or mooch with herring. Trollers also used herring from four to seven inches in length. 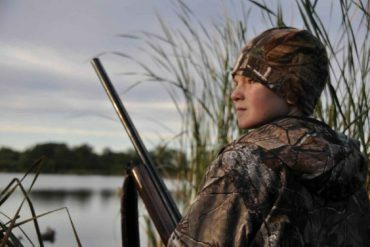 However, strip sales far exceeded sales of these other sizes of frozen baits during this period of time, with the exception of larger herring used for cut plugging. Herring strips were mass produced and were available at almost every tackle outlet in a various sizes and styles. Super herring strip was by far the most popular strip type. It was cut in a long triangular shape tapered thickest at the head to very thin at the tail. It produced a darting tail fluttering roll particularly when it was trolled at higher speed in lures like a Super Strip Teaser. It was deadly on coho salmon, especially the summer residents in Georgia Strait as well as adult migrating adult fish. Large herring strip was cut wider and thicker creating a slower roll which was ideal for both feeder and adult Chinook salmon. Tyee-sized herring strip was marketed specifically for adult Chinook salmon. It could be fished in any bait head and, as its name suggests, was generally about an inch longer that the regular sized herring strips. Tiny herring strip was another specialty cut that was popular in certain areas of the coast when needlefish or very small herring made up the bulk of the forage base. It was a bit shorter and slightly more than half the width of a standard sized piece of strip. Over a decade there were three events whose combined effects eroded the popularity of herring strip. 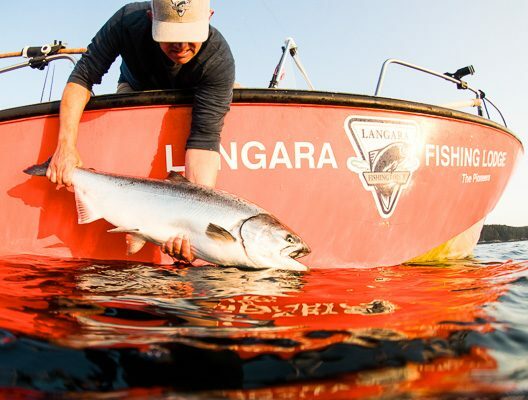 First, the introduction of the Hot Spot Apex lure took a substantial bite out of strip sales in the spring and summer coho fisheries that existed from Campbell River south to Nanaimo. These small to mid-sized Apex lures were effective on feeding coho salmon and were less expensive to use. Second, the introduction of frozen anchovies, called salmon candy by many anglers, had a much broader impact on strip sales across nearly every region where strip had been the dominant frozen bait. Anchovies were introduced to the sport market in the late 1970s and they soon became the “go to” frozen bait for recreational salmon trollers. 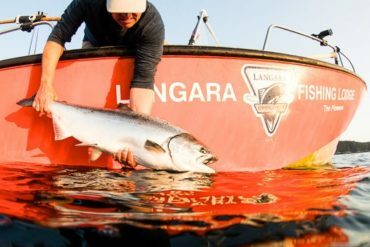 Finally, the complete exodus of resident summer coho from Georgia Strait meant that a significant target species for herring strip usage had disappeared from the fishing landscape. 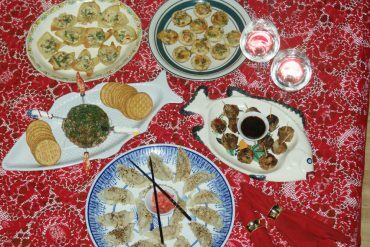 The introduction of frozen anchovies created of an entirely new category of bait-retaining lures. It didn’t matter if the existing bait lures were effective, if it did not specifically designate “anchovy” in the name or on the package it did not sell. Consequently retailers made sensible business decisions. Do they allocate wall and freezer space to anchovies and new lures like the Anchovy Special, the Krippled Anchovy and the Spring King, or do they continue to fill the freezers and walls with strip and herring strip holders? The answer was obvious as their customers were rapidly switching to anchovies and retailers had to react accordingly. This swing in buyer preference was also driven by economics. 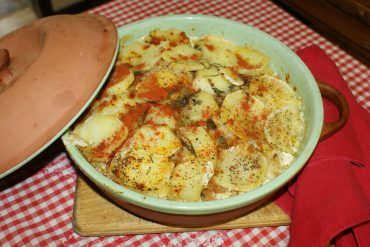 A tray of anchovies usually contained eight, 10 or 12 fish. A package of strip held only six strips but sold for the same price. So six pieces of bait versus eight, 10 or 12 baits didn’t make sense, regardless of the fact that strips could be re-used multiple times and anchovies could not. Within a decade, the once dominant herring strip had been relegated to a specialty item for a core group of die hard strip anglers who knew how and when to use it. 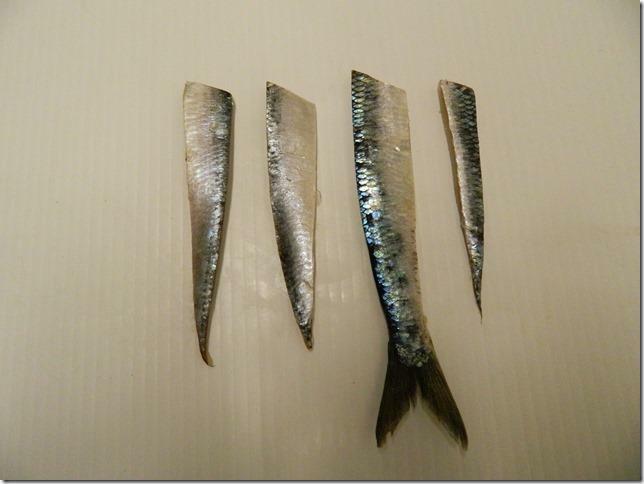 L to R: Super Strip – thinner from head to tail and triangle-shaped usually cut off the left side of the herring; Large Strip- less triangular in shape and a bit thicker it was usually cut off the right side of the herring; A variation of Tyee Strip which includes the tail of the herring and Tiny Strip cut narrower, shorter and triangular in shape. Via Tom Davis. Herring strips can be traced back to the late 1930s but it was not called herring strip at the time. History suggested that this fishing style was introduced by Puget Sound salmon fishermen who called the baits “cut spinners” or just “spinners”. This fishing style is still in use by Washington State anglers. 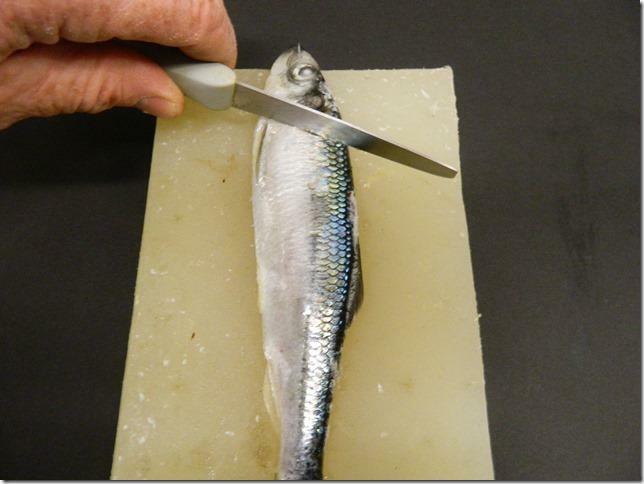 The “cut spinner” is basically the same as herring strip although it is fished without a plastic bait head. It incorporates some plug-cut herring technology such as the way the leading edges are cut and how the strip is rigged with single hooks. The lead hook is set through the front of the strip and tows the bait while the trailing hook is set through the back of the strip to help create the spinner’s action. With a bit of tweaking experts could get this bait to roll in a tight circle, hence the term ”spinner”. The rolling action was further enhanced by running metal dodgers or metal flashers in front of the bait. My father, Rhys Davis, learned this technique in the 1940s when he lived and worked in Seattle. 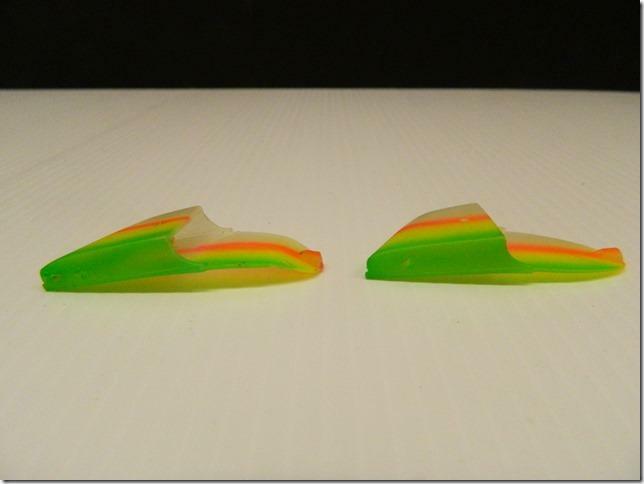 In fact, fishing with cut spinners provided the inspiration for his line of Strip Teaser lures. These plastic bait heads simplified the use of herring strip, created a consistent built-in action for the strip while protecting the herring strip from wear and tear. These improvements to cut spinner techniques also meant that individual strips could be fished multiple times. Cut spinner rigged behind a small metal dodger as this set up might have been fished in Puget Sound during the 1940s. Via Tom Davis. In 1954, Gordon’s Sporting Goods in Victoria became the first retail customer for his lures. 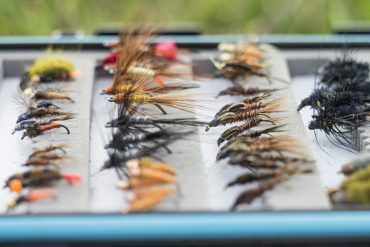 Initially Rhys relied on anglers to cut their own strip and included strip cutting instructions with every rigged lure. However he soon recognized that the mass production of herring strip was the only solution to meet market demand. This led to the first ever high volume commercial production of herring strips from his shop near Sidney, BC. Strip continued to be cut at that site until the early 1980s when the process shifted incrementally to Walcan Seafood on Quadra Island. Strip was cut from this facility for a further twenty five years. In the early years there were others in the strip cutting game like Tom Alexander, a well known Brentwood Bay high-liner, who sold Uncle Tom’s strip around the Victoria area. In the late 1970s Walcan Seafood began to build a substantial strip-cutting capacity before combining this capability with Davis’s strip cutting technology and know-how. 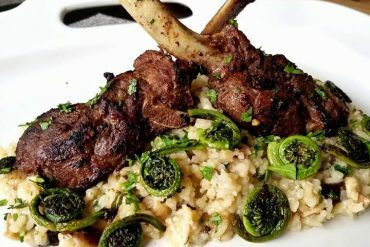 An interesting bit of history comes from the mainland side of Georgia Strait involving Dan Sewell, founder of Sewell’s Marina. In the late 1930s Mr. Sewell was already fishing cut spinners in Howe Sound. Whether he developed this technique or not is unknown because he did fish with friends and guests from the Puget Sound area. This story comes from a recent conversation with Danny Sewell, grandson of Dan Sewell, and longtime friend from our days on the Sport Fishing Advisory Board. He was able to provide me with some interesting information about the Sewell family’s connection with herring strip. As Danny tells it once his grandfather introduced this technique to Howe Sound the Province newspaper and others took great exception to the use of herring. Articles were written in the paper indicating these newcomers in Horseshoe Bay were going to bring infestations of dogfish by using herring. Apparently annoyed by this unwarranted sniping, Dan Sewell went to the Province’s office, walked in, stepped up on a desk, dangled a leader with a herring strip and said: “Is this what you are scared of?” The story didn’t end there. At fourteen years old, Danny, working beside other Marina employees, cut as many as two hundred packages of strip each night to sell to their customers the next day. This continued for a number of years until the business expanded into live bait and then finally to bringing in frozen herring strips custom packaged with the Sewell’s Marina label. 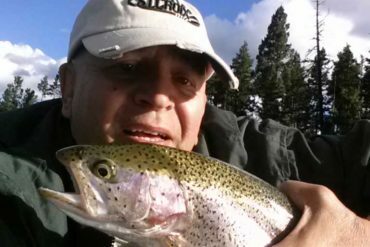 Though strip’s long run as a popular salmon producer has ended, there continues to be a group of anglers dedicated to using this bait and some have developed their own custom cuts of strip. 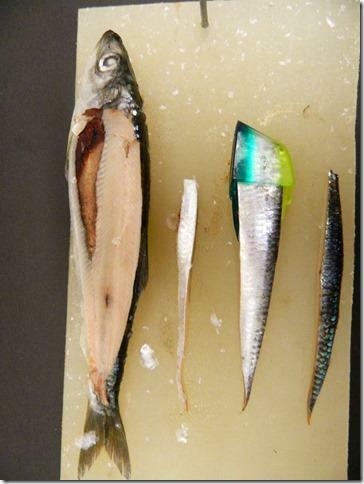 Many include the tail section as part of the strip because it makes the bait look more like real herring. Others, like Brentwood lure maker Jim Gilbert, made two or three additional cuts in the tail section so the tail fluttered as it rolled through the water. A few years before Jim passed away he and I enjoyed an August morning at Coal Island searching for Cowichan River Chinooks. I fished an anchovy and flasher combination while Jim packed a very sparse tackle box consisting of half dozen frozen herring in a cooler with ice plus a few lures, some hooks, leader, a knife and some swivels. He pulled out a black Super Teaser which he had painted himself, cut one piece of strip, inserted it in the Teaser, checked the action and sent it down to the desired depth. He added some slices to the tail and chose to fish it without a flasher or dodger. It was a tough morning for fish but the only decent salmon, a mid-weight teenager, fell to his specially cut strip. It doesn’t take long for lures to fade from public interest. In the case of over-hyped and under-performing products it can happen within a season. Basically they are featured as the latest and greatest one month then dumped in the clearance bins by over-stocked and bottom-line conscious retailers hoping to at least recover their cost of product by the season’s end. However herring strip is still an extremely good bait presentation in spite of the intense competition from anchovies and much improved artificial lures. The other thing that happens is that new generations of anglers either don’t know how to properly fish herring strips or they don’t know when to use them because they’ve never fished them before. Interestingly some commercial strips were re-introduced to the market in 2014 in key tackle outlets on southern Vancouver Island. Hopefully this new enterprise will expand next year to include the mainland and other important fishing areas in BC. However if this new strip cutting venture doesn’t pan out I have included instructions for cutting strip in the last part of this article. Here are some quick tips for when and how to fish strip. Strip lures adjusted for fast and slow bait actions. Via Tom Davis. Strip is a deadly presentation for actively feeding Chinook salmon. Most of these fish are in local waters between November and May while a few remain near the coast all year long. The best locations to experiment with strip include Barkley Sound, Juan de Fuca Strait, all of Georgia Strait including Campbell River north into Johnstone Strait. It’s very effective when salmon are gorging on small to medium sized herring or needlefish. 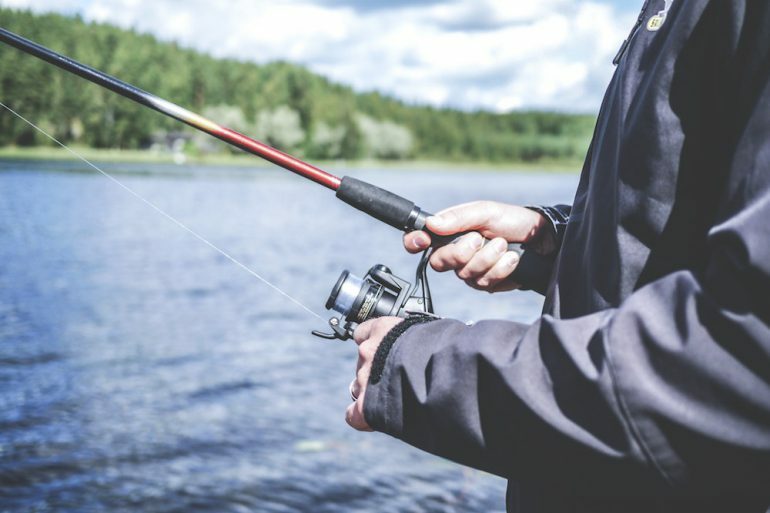 Anglers should fish strip so that it has a tight snappy roll turning at about one and a half to two revolutions per second with the hook hanging loose at the tail. Use leader lengths between 42- 60 inches with full sized flashers and 36-54 inches with medium to large dodgers, or run them without any attractors at all. Try to match the size of the herring strip to the feed. So if five to six-inch herring is the principle forage use regular sizes of strip. If it’s small herring or needlefish, as it’s apt to be near Sidney or Oak Bay yearlong or Barkley Sound in the spring, go with shorter narrower cuts of strip. 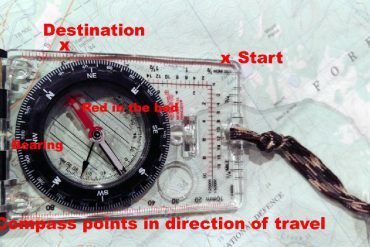 There are a number of strip holders that anglers could use. 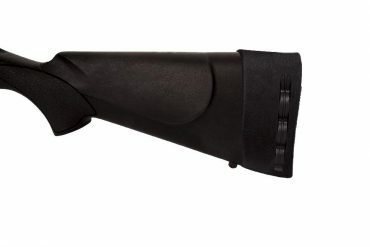 Most have a flat rectangular shaped cavity that the strip goes into and a longer slightly curved plastic tail with a blister on the end. The hole in the blister guides the leader to the hook with enough space to force a toothpick alongside the leader creating tension that holds the hook in place. Savvy strip anglers adjust the roll speed and characteristics of the roll by increasing or decreasing the bend on the long plastic tail. In photo # 3 the strip lure on the left has been bent for a faster more erratic roll. The last half inch of the tail has a downward bend which creates a faster roll. The tail of the strip holder on the right is almost flat which produces a slower less active roll. These adjustments produce dramatically different actions from the same lure and bait and give anglers to ability to compensate for trolling speed variations caused by changes in current and wind velocity. Coho Salmon love fast trolled herring strips. 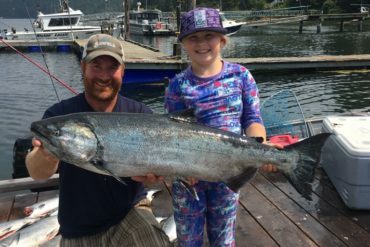 Late spring and early summer coho can be caught on anything, but bigger September and October fish are much fussier. Because of this I make sure that strip goes out on at least one rod and if it doesn’t produce I take it off. However it gets a shot on every trip because there are bites when strip out fishes everything else. I particularly like using it on my third rigger run shallow without any attractor and rigged with my lightest trolling rod. When a big coho whacks this set-up it brings the adrenaline rush back to coho fishing in a hurry. Fish strip up to twice the normal trolling speed for hooked nosed coho and use the adjustments previously noted to compensate for speed changes. 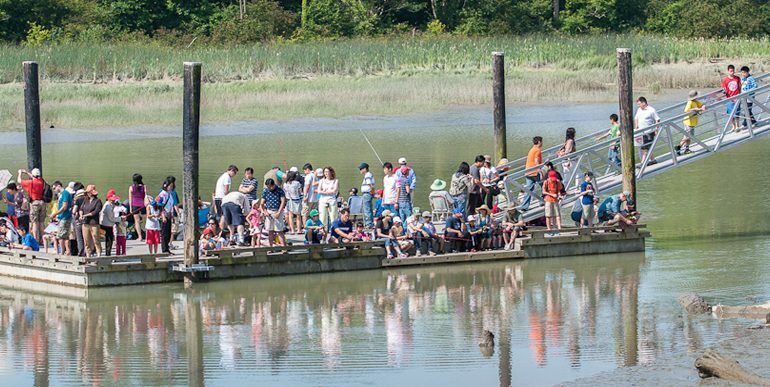 Both river bound and staging Chinook salmon like bigger sizes of herring strip. This is where Tyee sized strip cut from extra large herring can really shine. I classify river-bound Chinooks as mature fish on their homeward migration but not yet at the river mouth. Once they turn the feed button to the “off” position bigger strips become very effective. During this part of the migration using larger plugs, hoochies, spoons, anchovies and whole herring all have the same positive effect on catch rates. 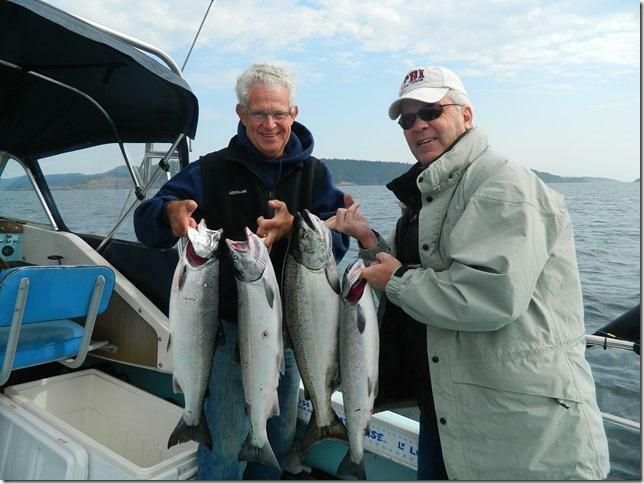 When I fish in Juan de Fuca Strait during August and September I include larger strip in my fishing arsenal. It can be rigged behind an attractor on a longer leader or fished without any flashers or dodgers. I often run it off a center downrigger without an attractor and set it at least twenty feet shallower than my other lures. These fish may have just quit feeding but they will still take natural baits with a moderately paced rolling action. The roll rate for bigger strip should be similar. Chinooks that are staging at the river mouth have quite different bait action preferences. A good rule of thumb for using any trolled bait is to progressively reduce the roll rate and activity of the bait the closer fish get to the river and the later it gets into the season. Between 1980 and 1990 the Barkley Sound- Alberni Inlet fishery for Roberston Creek hatchery Chinook was at its peak. I fished both areas but switched tactics within a few miles of the head of the Inlet. From Franklin River inwards to the estuary I relied heavily on big strip trolled slowly behind either full-sized flashers or big dodgers. The roll rate was often less than one turn per second. The equally slow roll of the flasher or the lazy kick from the dodger gave the bait a deadly action that consistently produced big fish. This tactic will work in any terminal Chinook fishery on the coast. Whole herring from eight to 10 inches long either frozen or caught fresh and then frozen. Regular sized herring strips, which are from 5 ¼ to 5 ¾ inches long require herring from eight to nine-inches in length, while extra large strips come from herring that are nine to10 inches long. An extremely sharp knife. Your knife should be easy to sharpen and it should hold its edge. This is the single most important item in your strip cutting tool kit. Sharpness is critical for making precise cuts and for safety reasons. I still use some of the custom made knives from the old commercial strip cutting days but I also use smaller readily available knives like the 4” Henckels shown in photo # 4. Note: I removed the knife point to stiffen the knife. A good oil stone (whetstone) is essential for keeping your knife sharp. Lock your stone in a vice, or construct a secure stand, so it does not move during the sharpening process. With either the coarse grit or fine grit side facing up, depending on whether you are grinding or finishing the edge, rub some oil into the stone and then start to work on the cutting edge by drawing the blade across the stone diagonally 10 to 15 times on each side. Repeat this and add oil as needed until the knife takes the edge you are looking for. A cutting board made from butcher block or hardwood. The board should be at least six inches wide and a foot long with a non-skid rubber mat attached to the bottom. To hold the herring to the board pre-drill a hole and then drive a nail through the board from the bottom to the top. Then sharpen the point of the nail. The nail should be positioned at the top end of the board and angled slightly forward. 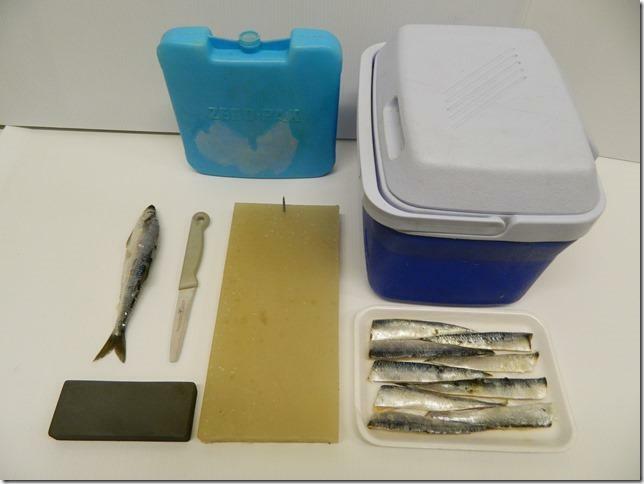 A cooler with an ice pack to keep your herring frozen almost solid prior to cutting. I suggest putting no more than six herring in at a time so that they do not thaw too quickly. It is impossible to cut good strips from over-thawed herring. Once herring soften the scales get wet. The wet scales pile up on the knife blade causing it to slip rather than cut. If you try to force the blade into the herring you risk serious injury. Some standard sized meat trays. Use these to freeze and store the strips. L to R: Herring, Henckels knife, Oil stone, cutting board. Standard six-pack beer cooler and ice pack and a finished tray of strip. Via Tom Davis. Either Ziplocs or vacuum seal bags to cover the strips once they are frozen. Whole herring must be cut at exactly the correct stiffness and degree of thaw. Thaw them so they just take a bend without breaking and then start cutting immediately. Only take one herring out of the cooler at a time. If the scales begin to dampen take a paper towel or cloth and wipe them dry. 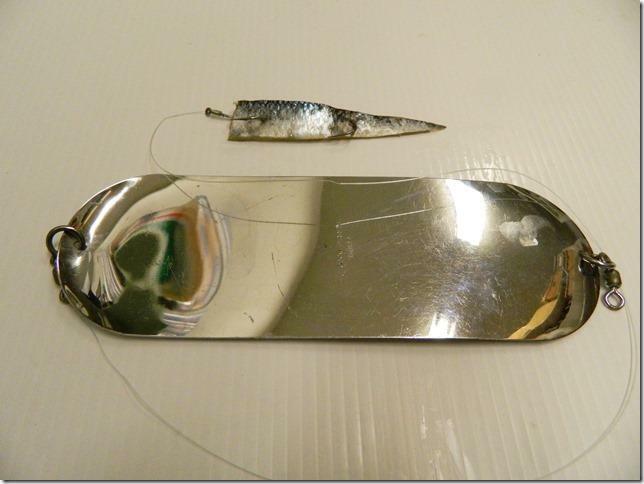 Here’s the process for cutting a stock pennant shaped herring strip. 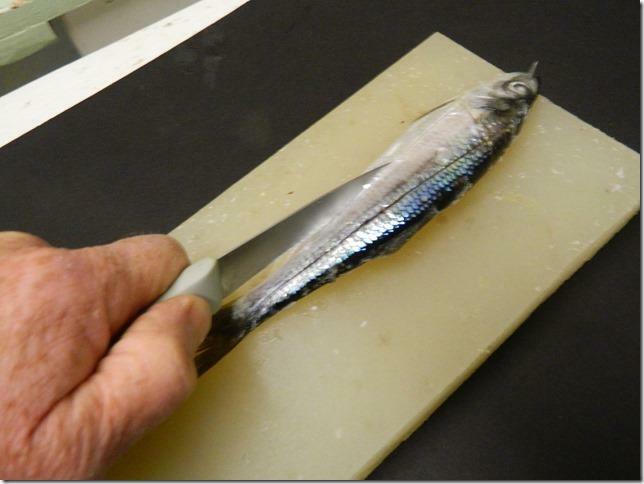 First straighten the herring by removing any kinks or bends caused by freezing and pin the head of the herring on the nail. Then follow the cutting instructions illustrated below. 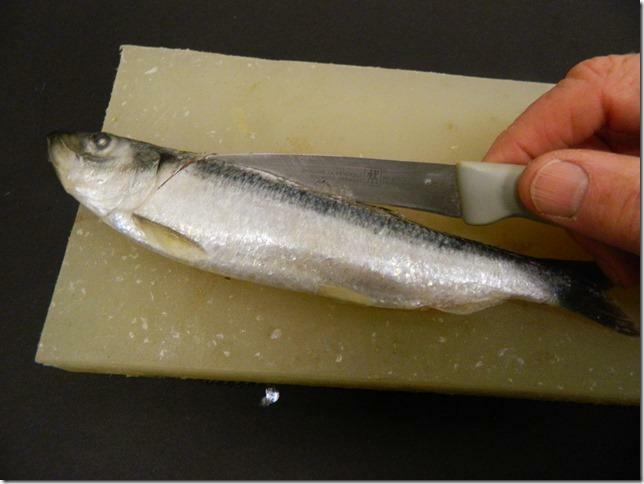 The first cut is made diagonally right behind the gill plate slating from the top of the herring to the belly. The second cut is a straight line from head to tail as high into the dark color of the herring as possible. The third cut is another straight line from head to tail through the silver belly portion of the herring. These two cuts should make a sharp point at the base of the tail. 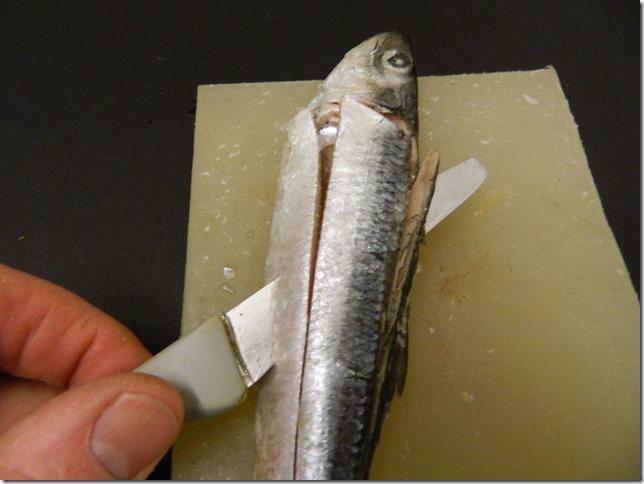 The fourth cut removes the strip from the herring. Lay the blade at a slight angle and begin the cut just ahead of the diagonal cut behind the gill plate. Cut deep enough to find the backbone and draw the knife back towards the tail of the herring keeping the blade flat against the backbone for the entire cut. Remove the strip, discard the unwanted cuts from both sides and trim the strip to the correct thickness and width to fit a stock plastic herring strip lure.